We’ve finally had some Spring weather here in Brooklyn, which has me craving seaside eats. So I ordered a bag of chowder clams (aka quahogs if you’ve spent any amount of time in Rhode Island, or watching Family Guy) thinking I was going to make clam chowder. That’s 100 large clams. I washed them and dumped them into a large stockpot, covered them with water and boiled them. As they opened and released their brine into the water, the air filled with the smell of the ocean. I grew nostalgic for summer afternoons in Rhode Island, sitting at Quitos, a seaside clamshack, sipping ice cold beer with my chowder and clamcakes. Snapping back to Brooklyn, and my steaming cauldron of quahogs, I quickly strained the clam broth and pulled the meat from the shells. 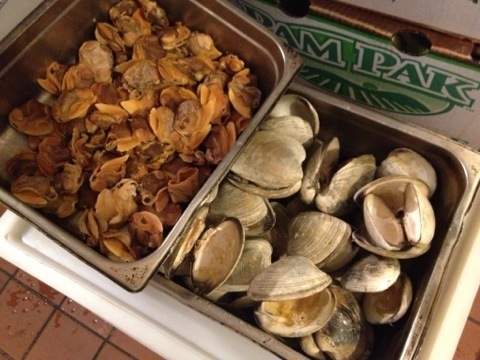 I was about to dump out the shells when I had a craving for a stuffed quahog. They are too tough to eat whole, but minced, seasoned, breaded and baked on their shells, quahogs are a totally different experience. Think sausage, but clams. We had never served anything like it at the restaurant so I wasn’t sure if it would be well received. 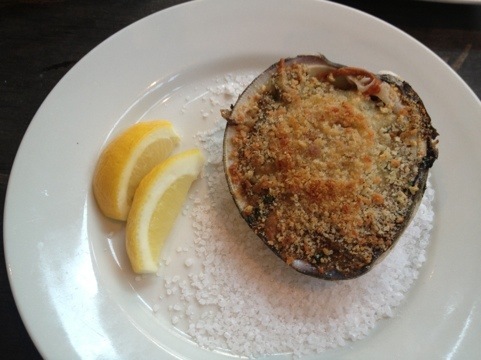 I mixed some of the minced clams with sauteed onion, bread crumbs, parsley, marjoram, and clam broth, and stuffed them into a few of the shells. To serve, we topped them with some cheese and more bread crumbs and baked them in the oven. There was a limited number, so we sold them as a secret special, not printed or written on the chalkboards. To both my surprise and delight, they sold out that evening, then again the next evening. I never ended up making any chowder. Tags: Chowder, Clams, Rhode Island, Seafood, Technique. Bookmark the permalink. Stuffies! I love it! What a great idea. Missing RI more and more. Sigh.